1723-96. He was born at Kirk Deighton in the West Riding of Yorkshire on 26 February 1723, the only son of Hugh Palliser, a humble and obscure landowner and captain in the army who died whilst Palliser was still a boy. He was the uncle of Captain George Robinson Walters. In 1735 he entered aboard the Aldborough 20, commanded by his uncle, Nicholas Robinson, removing to the Kennington 20 with this officer two years later, where he remained until 1740. He subsequently served aboard the store ship Deptford and the Tiger 50, Captain John Forbes, and on 12 May 1741 he passed for lieutenant aboard the Essex 70 commanded by his uncle, being promoted to this rank on 18 September. He was first lieutenant to Captain Richard Norris at the Battle of Toulon on 11 February 1744, and following the action, along with his fellow lieutenants, he levied charges of cowardice and misconduct against his captain which resulted in Norris’s flight from arrest at Gibraltar. On 3 July 1746 Palliser was promoted commander of the sloop Weazel 16 in which he quickly scooped up a number of French privateers, and on 25 November he was posted to the Captain 70 bearing the broad pennant of Commodore the Hon. Edward Legge in the Leeward Islands, although this was but a brief command as his senior officer died in September 1747. He afterwards served in the Sutherland 50 before being invalided home to England in March 1748 after being severely wounded by an exploding arms chest. In December 1748, having recovered, he took the frigate Sheerness 20 out to the East Indies, returning to England in April 1750 when she was paid off. January 1753 saw him appointed to the guardship Yarmouth 64 at Chatham, and quickly thereafter to the frigate Seahorse 24, which he commanded against the smugglers off the coast of Scotland. In January 1755 he sailed to Virginia with a convoy, and returned to home waters with the departing commander-in-chief Commodore Hon. Augustus Keppel a passenger. He was rewarded with a profitable cruise off Ushant in the Eagle 60 that autumn from which he returned to Portsmouth in November. Continuing with the Eagle, from 1756 he served under Admirals Hawke, Boscawen, and Knowles off France, in 1757 was attached to the Louisbourg expedition, and on 30 May 1757 took the East Indiaman Duc d’Aquitaine 50 off Lorient when in company with the Medway 60, Captain Charles Proby. In March 1758 he commissioned the new Shrewsbury 74 in which he joined the Unicorn 28, Captain Thomas Graves, and Lizard 28, Captain Broderick Hartwell, in the destruction of the French frigate Calypso in Audierne Bay on 12 September. After sailing for North America in February 1759 he served at the reduction of Quebec, following which his patronage of an able seaman, James Cook, resulted in the great explorer being promoted to the rank of master. From the summer of 1760 Palliser served in the Mediterranean under Vice-Admiral Charles Saunders, commanding a division that drove a French squadron from Toulon into Candia. In 1762 he went out in command of a squadron to Newfoundland to recapture St. John’s, but this already having been achieved he returned to England and the Shrewsbury was paid off in March 1763. From April 1764 he was a valued commander and chief and lieutenant-governor of Newfoundland with his broad pennant in the Guernsey 50, and with Captain James Chads commanding his pennant ship from 1766. During this period he was praised for his efforts to implement the results of the peace treaty with France and directed a survey of the coast by James Cook. In accordance with the tradition he returned home each winter, remaining in home waters after that of 1766. In August 1770 the first lord of the Admiralty, Admiral Sir Edward Hawke, appointed Palliser comptroller of the navy. On the occasion of the King’s review of the fleet on 6 August 1773 he was created a baronet, and on 31 March 1775 advanced to the rank of rear-admiral and installed as a lord of the Admiralty. In the same year Lord North appointed him to the lucrative position of lieutenant-general of marines, quite forgetting that he had already promised the vacancy to Rear-Admiral Lord Howe and creating no little amount of resentment in that officer. In 1776 Palliser’s plan for the relief of Quebec was accepted and successfully implemented by Captain Charles Douglas, who arrived off that beleaguered town on 6 May 1776. Promoted vice-admiral on 29 January 1778, Palliser joined the Channel fleet in March as third-in-command to his old colleague Admiral Hon. Augustus Keppel, flying his flag aboard the Ocean 90, Captain John Laforey, whilst the fleet assembled at Portsmouth. Later shifting his flag into the Formidable 90, Captain John Bazely, he fought at the Battle of Ushant on 27 July, where prior to the action most of the ships of his division received a signal from Rear-Admiral John Campbell, the captain of the fleet, ordering them to make more sail. Palliser’s efforts in the engagement were afterwards marked by a lack of support of his commander-in-chief, even though it was seen that he fought well. Keppel seemed happy initially with Palliser’s conduct, and the fleet proceeded to blockade the French at Brest in a perfect accord, but soon the newspapers accused Palliser of ruining the chances of a victory through his failure to support Keppel. When Palliser demanded that Keppel sign a paper condemning these remarks the senior officer refused, resulting in Palliser demanding a court martial upon his senior which the Tory government supported, but which the service and public did not. When Keppel was justifiably acquitted before Palliser’s prosecution, Palliser himself faced a court martial for insubordination, but despite public indignation which had led to his house being destroyed by the mob, he too was acquitted, although neither unanimously or honourably and at a personal cost of three thousand pounds. The fact that the ministry had ordered all the officers opposed to him to sea and recalled those who might show him favour at the court martial, including his own nephew, highlighted even more what the service thought of him. Vice-Admiral Hon. Samuel Barrington was conspicuous amongst many who refused to serve under him thereafter. Palliser had resigned his offices pending the trial and despite his request was not reinstated to any. However, as a reward for his loyalty to the Administration he was found a safe seat in Parliament and appointed governor of Greenwich Hospital on the death of Admiral Sir Charles Hardy in May 1780, and he remained there after the change of ministry, despite Charles James Fox raising a number of motions to remove him. He was advanced to the rank of admiral on 24 September 1787 and in 1795 received Princess Caroline at Greenwich. He died at his estate in Vache Park in Buckinghamshire on 19 March 1796 as a result of the wounds from his accident on the Sutherland in 1748, which had not only incapacitated him for many years but had also probably provoked his unaccountable behaviour in 1778. He was buried at Chalfont St. Giles and was succeeded in his baronetcy by his great-nephew, Hugh Palliser Walters. A single man, he had one illegitimate son, George Thomas, who became the naval storekeeper at Halifax, and whose removal by commodore Sir Charles Douglas was instrumental in that officer’s recall in February 1785. There was no doubt that Palliser was a capable and brave officer, but his support of the unpopular Tory ministry of Lord North led to his manipulation by the first lord of the Admiralty, Lord Sandwich, who used him as a tool to attack the Whig Keppel. He was a fine administrator who worked well with Lord Sandwich, spoke for him in the Commons, and stood by him in various political crises. His humble birth counted against him in terms of style, education and behaviour and perhaps resulted in his being easily offended. 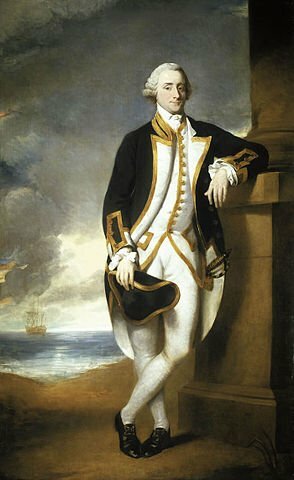 Admiral Earl St. Vincent thought well of him despite their conflicting political views and the fact that he was seen as the Earl of Sandwich’s right-hand man. In the mid 1770’s he received approximately five thousand guineas from the will of Admiral Sir Charles Saunders. Until 1773 he spelt his name as Pallisser. He was a friend of Captain William Locker and Mark Robinson, and Admiral Samuel Goodall, and prior to their disagreement in 1778 had been on good terms with Keppel, with whom he was a joint beneficiary of Saunders’ will. He was also an early and long-standing patron of James Cook to such an extent that he erected a monument to the great navigator’s memory in his estate at Vache Park. He was the MP for Scarborough from 1774-9, and for Huntingdon from 1780-4.